STANDISH—South Portland rolled into town on Tuesday night, June 5 – and rolled to victory: The Riots squeezed the Scots for 15 goals, while Bonny Eagle managed just one, an Anthony Breton strike with roughly three and a half minutes remaining in the quarterfinal bout. South Portland piled up five in the first quarter, six more in the second, two in the third and two in the fourth. Dave Fiorini led the Riots’ scoring with six goals and an assist. Alex Dyer assisted on Breton’s goal, which came following a mighty dash up the field and, really, made the whole process look easy. The Scots seemed thrilled with the goal, and happy even in defeat. Perhaps once the contest got away from them, they decided just to have fun. 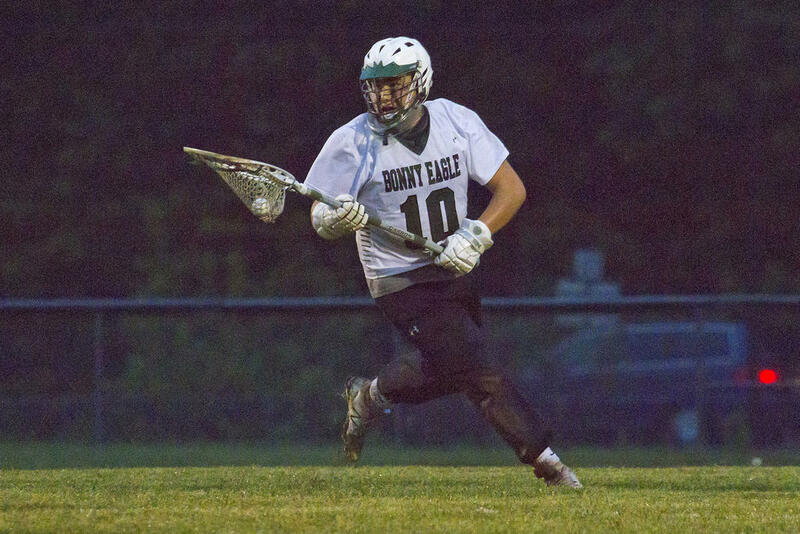 Bonny Eagle has looked good this season, with a diverse attack and strong protection, and Slefinger felt his boys were generally playing at that same level vs. the Riots. No. 4 Bonny Eagle returns to the sidelines till next year at 7-6. No. 5 South Portland jumps to 8-5. The Riots move on to face No. 1 Thornton Academy in the semifinals round. Cole Sullivan slips out of net for the Scots. Alex Dyer battles for the Scots. Anthony Breton celebrates after scoring Bonny Eagle’s lone goal. Tyler Williams vies with a SoPo opponent. Vinnie Bruni defends for the Scots. Scot James Conley dashes upfield. Griffin Madore surveys his pass options.